Apparently, orange juice is best served from a can. It's better...than what, I don't know. As I went to reference my copy April 2011 edition of Shape, I realized it was nowhere to be found. I tried searching their website, but came up with nothing. I did, however, purchase a can of frozen orange juice concentrate out of curiosity. This, of course, happened before I realized that I wouldn't be able to back up my intended claim for the day. I made the orange juice anyway. And it was dang good...but I couldn't tell why it was better. Although the more I sipped, the more I thought it had something to do with calcium levels. But I could be wrong, obviously. Needless to say, I have been twisting my brain over this issue for far too long already. I'd say the answer is on the tip of my tongue, but in this case, it literally is and I still have no idea what that answer is. Power Yoga happened yesterday. It was fantastic, except for the Side Crow pose. Like that was going to happen. (It didn't. At all.) I gave it my best shot, but couldn't figure out how to get my legs positioned correctly on my arms in order to promote the balance aspect of the pose. It's quite an impressive pose, really. And perhaps with a little practice I'll master it, but until then—I think I'll stick with the regular Crow. We did this one, too. I managed to get my feet off the ground for at least a few seconds, which I thought was good for a beginner. And no, I don't know the girl in the photo. I found it on FitSuger—click through to read some info about the Side Crow. 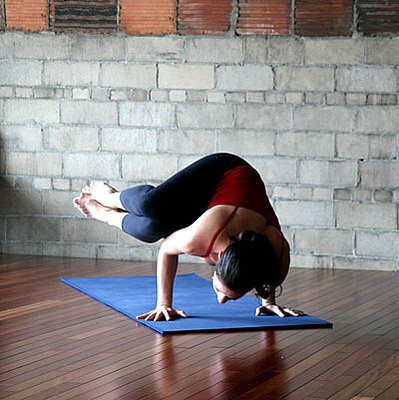 Question: What yoga pose are you currently trying to master? And if you've mastered the Side Crow, do tell a girl your secret! REMINDER! Don't forget to enter my giveaway! You just might win two packets of Cocomama Quinoa Cereal! (Contest ends at midnight EST on Friday, May 13, 2011). If you're a mom, I wish you a happy day. This fit foodie had one fine day.